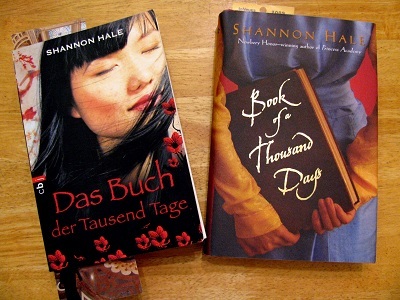 Today I’m going back to my beloved Book of a Thousand Days, by Shannon Hale, Das Buch der Tausend Tage. Last time on this book, we finished Tag 158 of Dashti and her lady’s time in the tower. Today we begin Day 160. As usual, I will simply quote interesting words and phrases and show how they were translated. I hope that this gives you a taste of the wonderful writing in this book without giving away the plot. = Der Wächter lachte wie ein wieherndes Pferd. = wir taten ihm leid, und es tat ihm leid, dass wir ihm leidtaten. = Sonderlich nett waren seine Worte nicht. Interesting that the translator changes some of the metaphors. I will stop there, at the end of Day 180, before Tag 223, when some awful things happen. Meanwhile, may this week find you munterer than before. This entry was posted on Sunday, July 17th, 2016 at 8:08 pm and is filed under Sonderling Sunday. You can follow any responses to this entry through the RSS 2.0 feed. You can leave a response, or trackback from your own site.